The purpose of this study is to analyze Mike Powell's world record long jump (8.95m) using a video based movement analysis system. 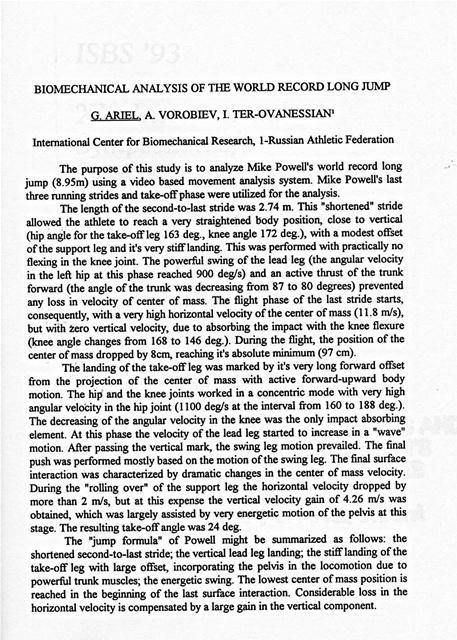 The purpose of this study is to analyze Mike Powell's world record long jump (8.95m) using a video based movement analysis system. Mike Powell's last three running strides and take-off phase were utilized for the analysis. 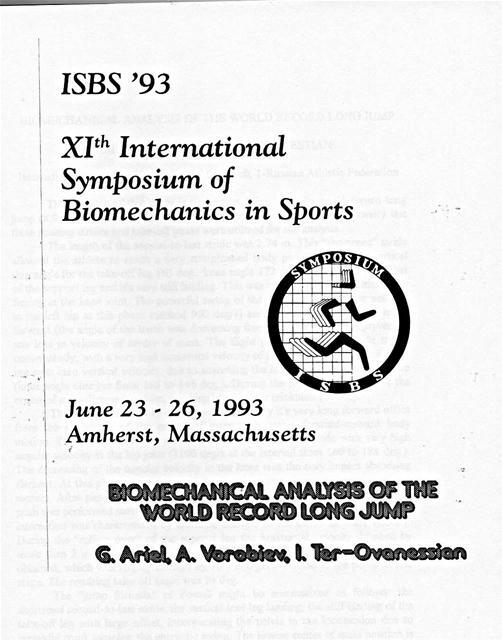 The length of the second-to-last stride was 2.74 m. This "shortened" stride allowed the athlete to reach a very straightened body position, close to vertical (hip angle for the take-off leg 163 deg., knee angle 172 deg. ), with a modest offset of the support leg and it's very stiff landing. This was performed with practically no flexing in the knee joint. The powerful swing of the lead leg (the angular velocity in the left hip at this phase reached 900 deg/s) and an active thrust of the trunk forward (the angle of the trunk was decreasing from 87 to 80 degrees) prevented any loss in velocity of center of mass. The flight phase of the last stride starts, consequently, with a very high horizontal velocity of the center of mass (11.8 m/s), but with zero vertical velocity, due to absorbing the impact with the knee flexure (knee angle changes from 168 to 146 deg.). During the flight, the position of the center of mass dropped by 8cm, reaching it's absolute minimum (97 cm). The landing of the take-off leg was marked by it's very long forward offset from the projection of the center of mass with active forward-upward body motion. The hip and the knee joints worked in a concentric mode with very high angular velocity in the hip joint (1100 deg/s at the interval from 160 to 188 deg.). The decreasing of the angular velocity in the knee was the only impact absorbing element. At this phase the velocity of the lead leg started to increase in a "wave" motion. After passing the vertical mark, the swing leg motion prevailed. The final push was performed mostly based on the motion of the swing leg. The final surface interaction was characterized by dramatic changes in the center of mass velocity. During the "rolling over" of the support leg the horizontal velocity dropped by more than 2 m/s, but at this expense the vertical velocity gain of 4.26 m/s was obtained, which was largely assisted by very energetic motion of the pelvis at this stage. The resulting take-off angle was 24 deg. The "jump formula" of Powell might be summarized as follows: the shortened second-to-last stride; the vertical lead leg landing; the stiff landing of the take-off leg with large offset, incorporating the pelvis in the locomotion due to powerful trunk muscles; the energetic swing. The lowest center of mass position is reached in the beginning of the last surface interaction. Considerable loss in the horizontal velocity is compensated by a large gain in the vertical component. Generated on 4/24/2019 9:27:15 AM (PST) ADI/HQ/GBA/2019/ARIELCLOUD/v3.0.2018.0126.